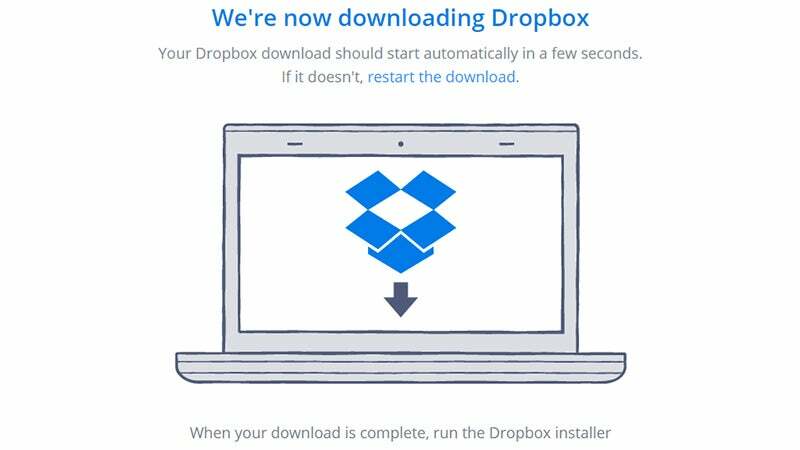 For almost a decade, Dropbox has been one of the most reliable and popular file storage services on the planet. When you compare it to other options like Google Drive and iCloud, Dropbox manages to strike the right balance between being super intuitive and easy to use. It can also do a lot more than just store your files. 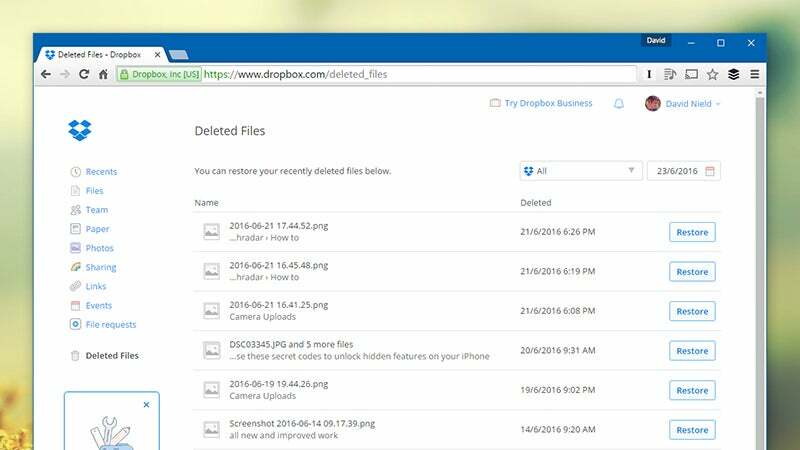 Here are 10 tricks that will make you a Dropbox master. 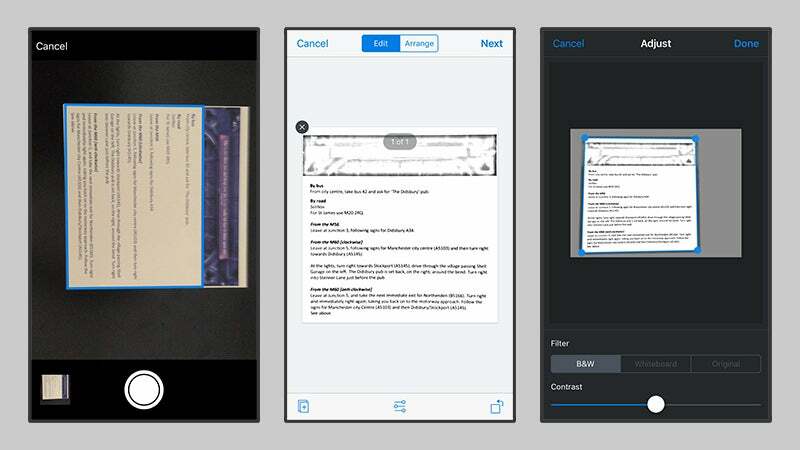 New to Dropbox’s iOS app (and coming soon to Android) is the ability to scan documents using your iPhone cameral. If you pay for a business account then you get OCR (Optical Character Recognition) thrown in as well, so you can search the text inside the document. From the Files tab, tap the new plus button that should’ve appeared at the bottom and take your picture. The app should identify your document with a blue outline, then give you options for rotating it, increasing the contrast, and creating multi-page documents. One of Dropbox’s most useful but lesser-known features is its ability to bring back deleted files (if they were synced to the cloud first before you erased them). Head to the web interface and click Deleted Files or browse to a specific folder and click the trash can icon. Deleted files are kept for 30 days, or longer if you’ve bought the Extended Version History add-on or signed up for Dropbox Business. Old versions of files are available too. Right-click on a file on the Dropbox website and choose Previous versions to access them. You don’t want anyone rifling through your Dropbox so it’s a good idea to use two-step verification and a strong password. If you’re automatically signed in anywhere (on your laptop or in a browser say) then make sure there’s another password or PIN in place. 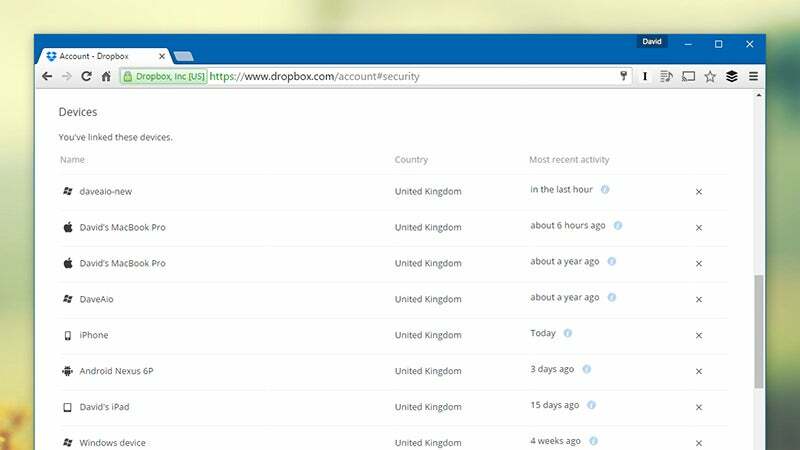 We’d also recommend periodically checking the list of devices with access to your Dropbox. You’ll find them under the Security tab of your Settings page on the web. Click the cross button to remove any devices you don’t recognise or which haven’t been accessed in a while. Sure, you want to share a folder with Bill from accounting right now, but what about next week? In a year? Putting expiration dates on any links you share is a useful way of improving the security of your Dropbox and keeping tabs on who’s accessing specific files and folders. 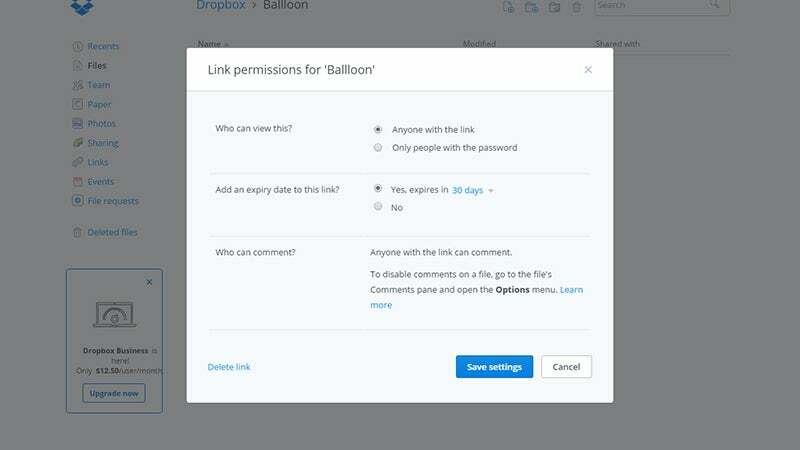 When you create a shared link on the Dropbox web portal, click Link settings to set an expiration date for it. You can also click Links on the left-hand navigation pane to revoke access to or set an expiration date for any of the shared links that are currently active. 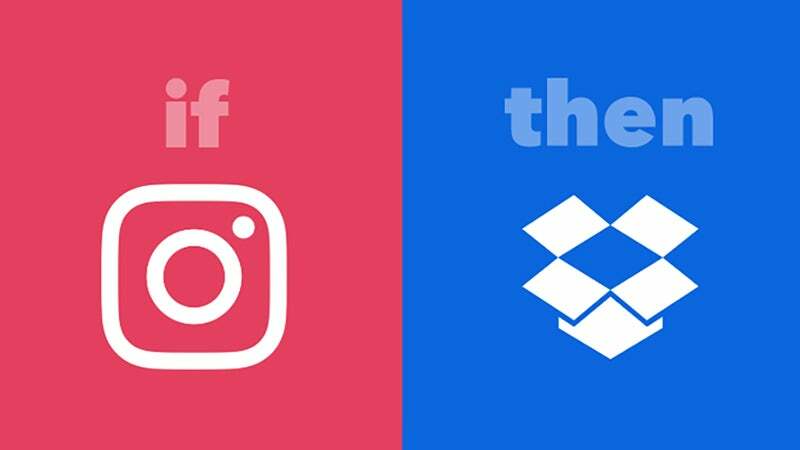 Our old friend IFTTT (If This Then That) works very nicely indeed with Dropbox, and with the right recipe you can save your Facebook or Instagram photos to the cloud automatically. You can use it to plug Dropbox into a tonne of other apps and services as well. IFTTT can also help you get around the new restriction placed on free Dropbox users, where new mobile photos aren’t automatically uploaded to the cloud without a desktop link. Use the Android Photos or iOS Photos channels to sync snaps as they’re taken. 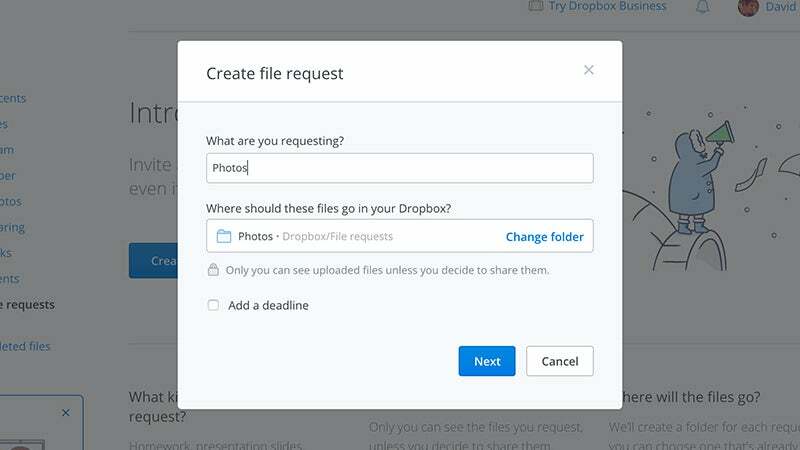 Sharing files and folders in Dropbox is easy enough, but what about requesting them from others? 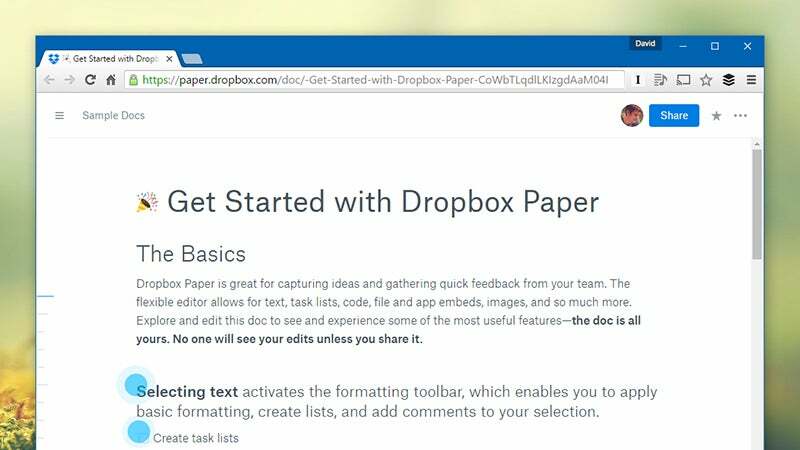 Last year Dropbox introduced a tool that enables anyone, Dropbox user or not, to push files into your Dropbox without having to log in or jump through any major hoops. Head to www.dropbox.com/requests, log in, and you can create a request: you’ll be asked to specify a folder and (optionally) a deadline as you go, and then you’ll get a link you can pass around as you like. Files uploaded via the unique URL can’t be seen by anyone but you. Thanks to the selective sync feature available in Dropbox’s desktop clients, you can delete the local copies of your files and keep them just in the cloud. Just unselect the folder after it’s been uploaded from inside the desktop app you’ve installed on Windows or macOS. Don’t just delete the file from your hard drive, as that will erase the local copy and the cloud copy. If there are files you don’t need regularly, but still want to keep, it’s a handy option to have, and it’s something that Dropbox itself is working towards with Project Infinite. 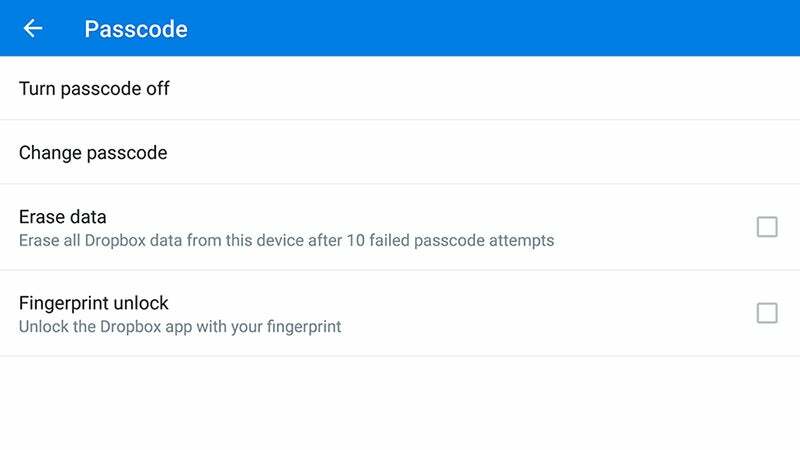 You can protect the mobile Dropbox app with a separate PIN code if you’re worried about someone gaining access to your files. It’s a simple 4-digit PIN that you then have to enter any time you want to open up the app, and there’s also the option to erase any offline files if the incorrect passcode is entered more than 10 times in a row. If your device supports it, you can also use a fingerprint to unlock the app. If you want to be the first to find out about new Dropbox features, then you can sign up to test the beta versions of its desktop clients. These are usually pretty stable, but the standard warning applies that you run beta software on your machines at your own risk. 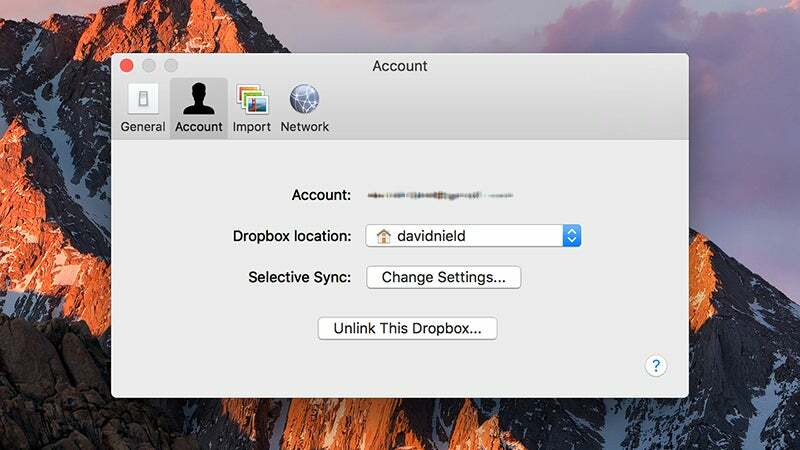 It’s a clever way of accessing Dropbox goodies while they’re still being tested. There’s a box marked Include me on early releases under Settings on the web for your desktop clients, and a Get early releases option on the Settings screen for the Android app. Speaking of beta software, Paper is a note-taking, Google Docs clone developed by Dropbox and current in its testing phase. If you request a Paper invite through your Dropbox account on the web, then you should be able to access the beta pretty quickly. You can apply formatting to your text, drop in images, tables and to do lists, and split documents up into folders. It’s a lot like the free-form tools in Evernote and OneNote, and if you’re collaborating with other team members, it becomes even more useful.